I’m a few days late with my DB post this month, but I got it done in time for Christmas Eve. 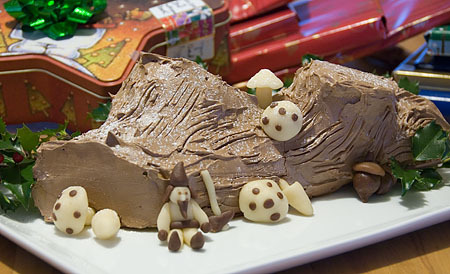 This month our daring assignment got a holiday themed recipe: Yule Log. This is one of those recipes that may make you cringe a little bit when you first look at it; a cake, frosting, and two garnishes. There isn’t a whole lot to worry about here if you take your time and plan accordingly. Both the cake and the buttercream use similar methods of heating the eggs and sugar over a bain-marie, if you get one right, you should be able to have success with both. I have to admit that I got to see a few of these completed before I even started making my pastry and I took some inspiration from a few of you out there. I decided to fill my cake with vanilla scented pears and frost the whole thing with chocolate buttercream. I may have deviated a little bit from the recipe suggestions, but I’m not a huge fan of coffee and the color just didn’t seem dark enough for me. The pears and their juices soaked into the cake nicely so no additional soaking syrup was needed. The cake ended up nice and moist with just enough fruit in each bite while not being overpowered by the chocolate buttercream. I was surprised by how much frosting this recipe yielded. There is probably enough frosting here for me to frost three of these cakes! I’m sure I can find a use for the massive amounts leftover, but I’d consider at least halving the recipe even if you are going to use the buttercream as a filling as well. I skipped out on the meringue mushrooms and just went with marzipan decorations. The marzipan was quite easy to work with and the color worked nicely for some mushrooms, acorns, and a forest gnome (with axe!). I colored the marzipan brown with some cocoa powder which made it slightly chocolaty as well. Loved the marzipan figures! You can buy blocks of marzipan from Amazon. They are a lot cheaper than buying almond paste in the store. If you can find Wilton edible paint (discontinued) it works great! Wonderful yule log. Love the two knobbies and your mushrooms! A very creative Buche de Noel! 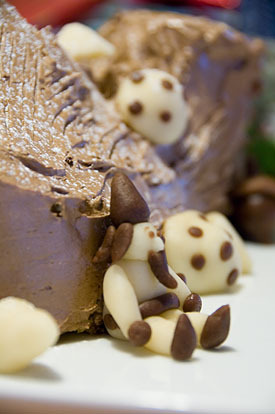 Love all the dotted mushrooms and the forest gnome.The pears would have added a special touch to the dessert as well!! I’m so glad you found the time to join in on this one. Vanilla scented pears sound like a lovely — almost healthy — choice for the filling, and I love your forest gnome. I ended up with a lot of extra icing as well… a little goes a long way. It made a nice frosting for dark chocolate cupcakes, if you’re still trying to dispense with it. How very cute you little guy is! Your cake sounds delicious! And I love your marzipan figures – they are great! Nice job! The vanilla scented pears sound wonderful! Hope you have a happy 2008! Your log looks wonderful. I love your marzipan characters. The vanilla scented pears sound wonderful, even if it wasn’t your idea. Congrats on a successful challenge! Your yule log is gorgeous! Ok – so I am a little late in my DB comments…. but – your log look wonderful. And the little man? So cute! I’m loving the vanilla scented pears. Nice job. Your wood gnome is adorable. The pears were a nice touch. A lovely log…late or not. Nice log! Great job and hope you had a wonderful Christmas! I love your comment, there isn’t a whole lot to worry about if you take your time, etc. I’m sure there isn’t a whole lot to worry about if you’re a trained pastry chef either! 🙂 I didn’t get around to it, but I wanted to – I swear. I wound up buying yule logs from Opera Patisserie here in SD. I got one chocolate and one coffee – and much to my surprise, the coffee one was more popular than the chocolate – go figure. Hi Jef – Thanks for the comment on my blog. I actually started on an insulin pump back in July and haven’t looked back. I absolutely love it and (like you) I highly recommend it to every diabetic I come across! Glad to see another Type 1 in the DB mix, I’m looking forward to seeing you in many other challenges ahead… great looking log by the way. Fun decorations and a lovely cake. Changing the flavors was authorized so you are good to go! Nice flavors and cute marzipan decorations! Glad you could join in the fun! Love your creativity with the vanilla-scented pears and marzipan decorations! I agree with you about the coffee buttercream. I ended up using chocolate 🙂 Hope you guys had a nice Christmas!